'Behind the Scenes' is a programme run by Chantry Dance Company open to the whole community. Any school, community group or individual with an interest or curiosity about dance is welcome to visit the company at our studio in Grantham during our rehearsal season. You are invited to come and watch the professional dancers take class, and also to observe rehearsals and the creation of new work. 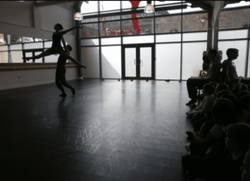 This programme aims to provide the opportunity for the community to engage with the company and learn what a professional dancer's work day involves, as well as finding out how what goes into the process of creating a contemporary ballet piece. The programme is completely free of charge. ​"We really enjoyed the breath-taking performance and we were very inspired by the moves. We particularly liked how the dancers expressed their feelings through their movements. The picture that we have chosen is our favourite because it is captivating and elegant. Thank you to all the dancers!" Thank you very much for letting me come and see you on Friday, I really enjoyed it and loved talking to you and Rae. It was great watching and trying to learn some of the moves and I was amazed how quickly you picked up the exercises and routines. It was really interesting how you choreographed the dance and how it has to be perfect before you move on. I think you’re all brilliant dancers and it must be really hard to get up to that stage. I loved seeing you do the jumps and the black hole dance being made. Thank you very much for giving me opportunity to come and see you, I loved it."